PIOMAS has released updated sea ice volume estimates a little earlier than usual. 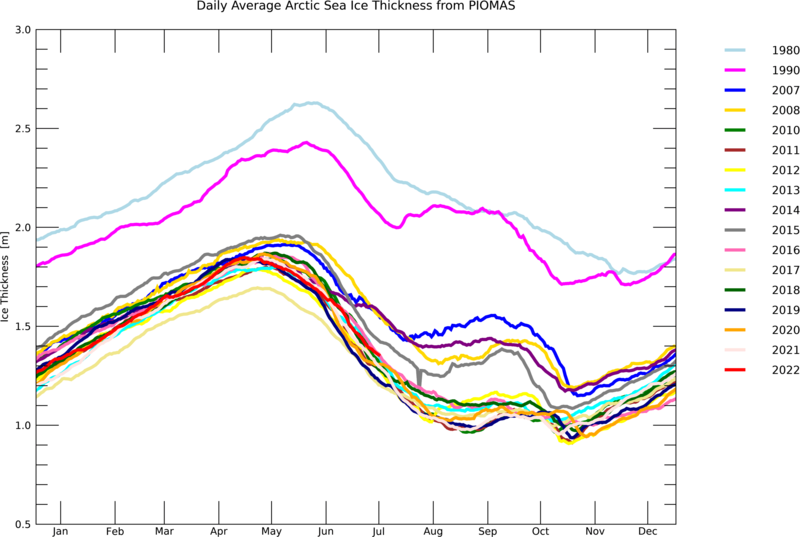 We have now broken the record for lowest sea ice volume, making a “triple play” of record-breaking volume, extent, and area. This entry was posted in climate change, Global Warming and tagged Global Warming. Bookmark the permalink. Broken link. The PIOMAS link at the start of the article points to this blog post. Melting is slowing down now; you can probably make an educated guess at what the year’s minimum should be. It’s going to be interesting to see what curve fits on the minimum volume fit well with this year’s minimum and what one could say about when the first ice free day will be. A week and a half ago I suggested that the PIOMAS identification of the record would occur a month earlier than usual. As with my other estimations on that thread, I was overly conservative. 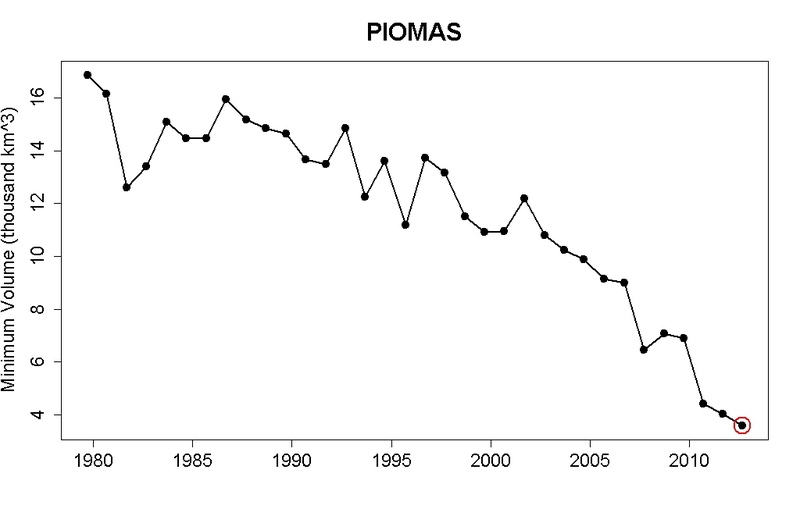 It says a lot about the nature of what’s happening in the Arctic that the monthly PIOMAS increment was released so early. I’m curious… who might be the first leader of a nation to stand in front of a camera and tell the world that Santa and his elves and reindeer are climate refugees, desperately swimming to a safe haven seeking protection? It won’t be Tony Abbott. He’s quite prepared to tell the Australian public that “climate change is crap”, but he wouldn’t deny the existence of Santa if it lost him even just one vote. Ironically if Santa and the crew fled a wet North Pole by boat and turned up at Christmas Island, where most refugees and asylum seekers end up when venturing to Australia by sea, they’d be shunted off to an offshore detention centre (= concentration camp) where they could spend many years behind razor wire. Such is the world in which we live. When the summer day comes that there is negligible sea ice, Australian political cartoonists will drooling like dogs with a bone. The image of Santa in a boat, the reference to Christmas Island, Alan Jones’ repeated advice to throw chaff-bagged politicians into the sea for pricing carbon – the possibilities are endless. Still, a clever cartoonist might be able to evoke profound visceral appreciation in a public previously complacent about the immediacy of the problem. The trouble is that the reindeer will well and truly have bolted (erk, that word again) by the time we come to our collective senses. I wonder how many parents will have the decency to feel guilty when their kids ask them what they did to try to stop Santa from sinking into the sea? Heh, I’ve been working on a song too, but I don’t have the heart to put it up. Having little kids, it seems to be just too Grinch-like to abet the destruction of their childhood by writing such song lyrics, even if I’m standing in opposition to the root cause. It truly is a messed up world. Tamino-sama, have you seen this little gem? McLean & De Freitas II, detrend-o-nic bugaloo! Admittedly the abstract is ambiguous. I can’t access the full text, so maybe they explicitly state that they are only tracking relationships between *short-term* fluctuations (which do flow from temperatures to CO2). Because that’s what they do. I just read the abstract. 1. where’s the energy coming from that raises the ocean(sea surface?) temperature? 2. where are human CO2 emissions going when the warming is causing the ocean to emit CO2, and why does the mechanism shut down when the ocean isn’t warming and emitting CO2? 3. does their “globally averaged well-mixed marine boundary layer CO2 data” lag global CO2 emissions , and/or “well mixed NON marine boundary layer atmospheric CO2 levels, by, oh, 11-12 months? 4. What’s the lag time of their “global averaging” method for CO2? 5. Why did the lag change from ~ 800 years at the end of the last ice age to 11-12 months today? 6. “…changes in atmospheric CO2 are not tracking changes in human emissions.” I downloaded Mauna Loa CO2 from http://www.woodfortrees.org/data/esrl-co2/mean:12/from:1959.7/every:12 and anthropogenic CO2 emissions from http://co2now.org/images/stories/graphics/carbon-budget/global-carbon-budget-2009-data-co2now.pdf, and found that the correlation between Mauna Loa CO2 and 315 + 0.21 * CO2E is 0.99948496, with a 95% confidence interval of 0.9991 to 0.9997 – whadda they want, 6 nines? 7. Is it worth paying $39.95 for the whole arcticle (Freudian typo – &;>) to see what they’re really measuring? Point 5 reminds me of a recent comment stream encounter with someone who used the 600-800 year lag assumption to claim that current atmospheric CO2 is the natural result of a MWP solar spike. I asked the person to do the math to figure out the size of the solar spike that would be necessary to force 120ppm+ additional CO2 into the atmosphere in just 150 years. Oh, and explain why no evidence of such a spike exists in the various proxies. No doubt the spike slipped through due to poor resolution. The PDF link goes to the accepted manuscript – for free. Aha! Apparently, I have access through work. You might come up with that rubbish in a comment stream, but in a supposedly peer-reviewed paper ? Seems like Monckton is not really up to speed with calculus, as well as basic reading comprehension with regard to technical papers. I was thinking of commenting there that Monckton’s work would face some stiff challenges if put out to peer review. Now I see I might have been wrong…. Frustrated by the pay wall, I googlescholared the authors instead. We should have been paying more attention to they and this fine journal, turns out global warming since 1850 was due to natural celestial cycles after all and all. And we’ve been making this great fuss all along. I feel slightly embarrassed. But if you look at Fig. 1 they get their CO2 from NOOA so maybe that explains their conclusions. The authors are comparing *1-year differenced* series, but don’t clearly state this in the abstract – in fact they imply they are analyzing lag in overall change, not 1-year differences. The charts make the game clear, though. Poor Prof Salby must be very annoyed that these two have beaten him to ipublication. This work appears (from the descriptions above) to be basically the same as the stuff he presented to the Instutute of Public Affairs (Australia’s own Heartland equivalent) a little over a year ago. Probably because he is a bit fussier in choosing the journals he wanted to publish in and those journals are a bit fussier about what they publish. And now it appears that it has also been plagiarized before its publication. CO2 concentration increase after seasonal warming events (like El Niños) due to lowered gas solubility in warmer waters (among other processes) what is not mentioned is that the spikes in SST and CO2 concentrations that are compared to show the “warming causes CO2 increase” correlation are just year-to-year fluctuations, in effect, they are one of the best known natural climate variability patterns: El Niño-Southern Oscillation (ENSO). Thank you Barton Levenson for giving us this gem of a joke! What happened? The peer review comitee were all drunk? I would fire them inmediately for accepting this material! Reminds me of Tim “correlation trumps physics, especially the way I do it” Curtin’s philosophy. Looks like the emeriti have struck again. The author trio started writing papers on AGW in 2011, according to google scholar. Humlum is a geology professor researching mainly geomorphology. His publications go back to 1976, so I guess he’s emeritus or close to that. Stohrdahl has an MSc with statistics background and is/was working in market research / forecasting in telecommunication. At the age of 67 I guess he’s retired. Solheim is an emeritus astronomy professor. From the paper that I had a look at they seem to be doing forecasting from curve fitting w/o setting aside a period in the data for verifying their fit. Is there a physical explanation for the apparent hump that seems to manifest at this time of the year? Bernard J – Maybe the early autumnal storms heaping up thin ice into thicker packs? The thinnest ice has already melted, leaving the more solid ice. An easier way to understand it is to think about it backwards – look at the dip in October. This is caused by the rapid formation of lots and lots of very thin ice, as the surface skins over. Hope someone publishes a response on this. How could this piece pass peer-review? It’s the same crap as Carter/De Freitas with much bolder conclusions that are totally unsupprted by the analysis. Thanks enormously. I’m chagrinned at the simplicity of the answer – it’s patently, glaringly obvious now that I think about it. Doh! Oh, good! We could use some. Except no miracle involved in this data: it’s been a consistent pattern for over 20 years now, and shows no particular sign of slowing down. the next few arctic summers are going to be VERY interesting…. Tamino’s newest post gives a pretty good picture of where things are headed….with an El Nino year coming up; interesting, maybe, depressing, certainly. I asked him him if he was seriously dismissing the notion that the strong warming trend in the Arctic for the last couple of decades had played a part, but he didn’t allow the post. What are the odds that the last 6 September minimums are all the lowest in 34 (the satellite record)? If it was a lottery, it would be 1 in 1,344,904. I would venture that this was the likelihood of the last 6 years of record-breaking minimums being a result purely of weather fluctuations, but perhaps there are other considerations my maths-poor (and physics-poor) brain hasn’t grasped. Should I assume Anthony misunderstood what I was saying, or does he really think that the decline in September sea ice extent of 36% is a result of chance? So what Watts is saying is that it’s not climate change, but weather change. Of course, if Willard isn’t going to accept that it’s weather change either he then needs to explain why there’s no weather signal as extreme as the last few years (as indicated by Barry above) in the record prior to about the last decade. My money would be on Willard claiming autocorrelation, so the paradigm would be ‘no climate change but weather that is autocorrelatedly and persistently trending downward in the disguise of a climate change’. Watts ultimately is a clown. He is a pitiful excuse for a human being, a cautionary tale of lack of potential realized. Bernard, I’m afraid that there is no backing the likes of Watts into a corner–logical consistency can always be dispensed with in his universe. So he’ll just walk right through that wall on you, and on into cloud-cuckoo land. Kevin is right. Watts is doing a political job, not a scientific job. He doesn’t give a damn about the science. He wants to win. As I’ve mentioned before, he is formally associated with the GOP. His job is to confuse the debate, not to enlighten people. And he’s good at what he does. I think you should assume that Watts is dishonest, and has an agenda that has nothing to do with science. Dhogaza, I’ve *loooong* ago arrived at that very conclusion: Until about 2 years ago, I has studiously avoided visiting WUWT for fear it would…. *get on me*…. ;) I read it when it’s relevant to a discussion on SkS, but other than that, tony’s transparent agenda is…well, transparent. What dhogaza said. If there are any obvious signs of honesty exhibited by Mr. Watts, I am afraid I must have missed them. All is well with the world, Watts analysis is flat out wrong again. A single storm lasting a few days does not make a melt season. 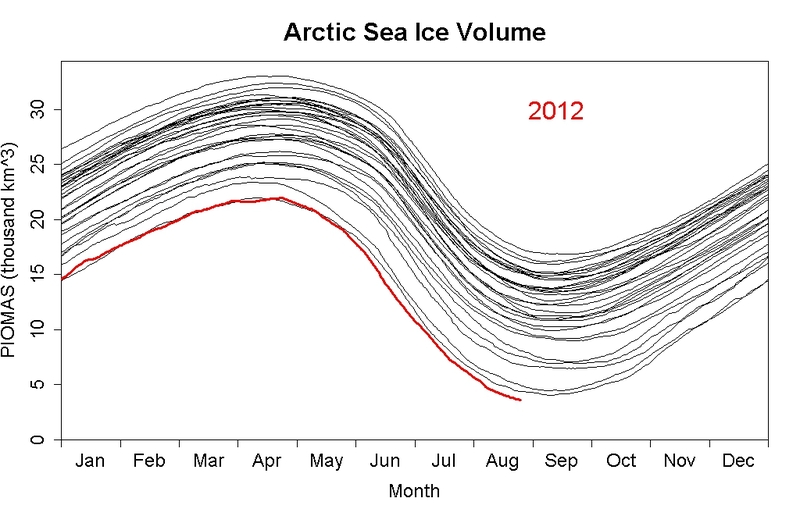 In past summers there were multiple storms but at the end there was more ice by mid september. Is the heat from the sea which melted the ice, this heat still persists. No wonder Watts sea ice prediction was off by more than 1.5 million square Kilometres ….. and counting…..
Perhaps some here may be interested. Or two: one to keep, one to give.